In the last few years, you’ll have noticed a push for kids to start swim lessons earlier on in life. What age can babies take swim lessons? Well, according to new recommendations from the American Academy of Pediatrics, the best age to start swimming lessons is now thought to be right around a baby’s first birthday. And this is giving people some feelings. If you’re a Mom with a Facebook account, you’ve probably seen the terrifying videos of someone carelessly throwing a baby in footed pajamas into a pool. This video has taught you what to expect at baby swim lessons, and you don’t like what you see. You’ve probably yelled at your computer screen when the baby seemed to struggle to roll onto his back. You may have even tried to jump into the computer to rescue the baby that’s working way too hard to get back to the side of the pool. When it was all over, you huffed and said, “that cannot POSSIBLY be the best age to start swim lessons. Are you crazy? ?” And while I generally don’t insist to people that I’m in my right mind, I will tell you that I’ve done that. Three times. 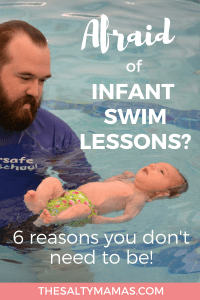 Not to say that it didn’t sometimes have me on the edge of my seat, but now that I’m five years into this survival swimming thing I can say with confidence that if you’re wondering what age can babies take swim lessons? Well, the best age to start swim lessons is whatever age your kids are now. Here’s what to expect at baby swim lessons. I remember the first time I brought my parents to my baby’s survival swim lesson. I had been taking her in secret for about six months because I knew my parents had no idea what to expect at baby swim lessons. 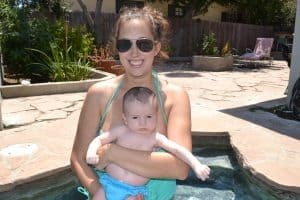 My Mom was horrified that I would hand my precious baby over to some stranger in a pool. I tried to explain that he was a) only a stranger to my parents, not to me or my daughter, and that b) he wasn’t like some unqualified stranger off the street. It wasn’t his first day on the job. They don’t just go and hand a newborn baby to a person that’s never taught an infant swim lesson before. Beyond that, our swim teachers have become like family. They have spent countless hours holding my babies, comforting them, and bonding with them. They have taught them how to swim and how to trust. It may seem hard to believe, but infants are actually more predisposed to be successful at swim lessons than an older child or even toddler, making the early years the best age to start swim lessons. I mean, think about it. Your kid just spend nine months under water, so it’s pretty much their natural habitat! After birth, this reflex is known as the mammalian diving reflex and it’s actually about so much more than just knowing to hold their breath. According to Popular Science, “When the face of an infant is exposed to cold water, the heart slows down and blood is shifted away from the peripheral muscles to conserve oxygen for the brain and heart, and they typically hold their breath.” If you want to test this, but are afraid of dunking your baby, blow a little puff of air in their face and watch what they do! See the way they hold their breath? That’s part of the dive reflex in action! Your Kid Might Cry – and That’s Okay! 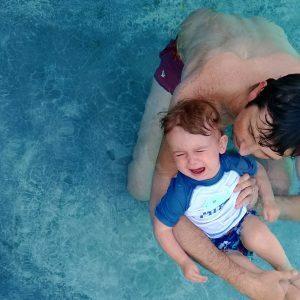 When we first started wondering what age can babies take swim lessons, our son was ten months old. And boy did he cry! Truth be told, he didn’t cry – he screamed. People thought I was cruel for “forcing him” to do something he clearly didn’t want to do. There was concern that I was damaging him somehow by making him do something he was afraid of. But it would have been silly to assume he wouldn’t cry. And it would have been even more silly to remove him from the lessons because of those tears. Swim lessons can be hard, frustrating and new for a child. But exposure in a safe and trusted environment can change the experience from tears at having to get in the pool into tears at having to get out of the pool. Today, that screaming ten month old is a five year old that would live in the pool if he could. He prefers to spend his time underwater, or working on his cannonball. And every day I’m thankful I didn’t give into a few tears and take away an incredible opportunity to teach him a skill that could save his life and give him a world of fun and healthy activity. Why do we let our kids flounder in the water a little bit? So that they know that they can drown. This may sound mean, but it’s darned effective. My kids have a very healthy respect for the water. Kids that are held safely in a parents arms the whole time they are in the water may not understand the consequences of jumping into a pool without an adult nearby. Children that take survival swim lessons from a young age know when they are ready to be in the pool on their own – and more importantly, when they’re not! And, of course, when they’re not, Mama’s arms are still a great place for baby. Those videos you’ve seen? Those kids have probably been in survival swim lessons for over a year. That is NOT what to expect at baby swim lessons, at least not in the early stages. Early lessons include the baby being held and gently going underwater for just a moment. There’s lots of cuddling and building trust between the instructor and the student in those first lessons. 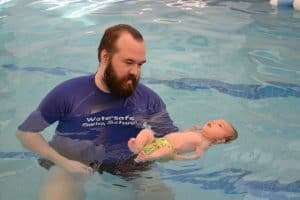 Once the baby is comfortable just being in the water and with very short submersions, the instructor will help them with back floats, rolling over assisted and then on their own, followed by rudimentary swimming. Eventually, after months and months and months of lessons, the now not so little baby will be able to roll onto their own back, float, and hopefully kick their legs to swim them back to the side of the pool. Only then do all the pieces come together and everyone is comfortable testing the baby’s abilities. Even though I know what to expect at baby swim lessons, I’d be lying if I said it isn’t a little nerve wracking. Every time we’ve gotten to this point with my children I’m nervous, excited and maybe a tiny bit scared. But I know it’s irrational, as the babies are surrounded by adults carefully watching and ready to intervene if assistance is needed. But I can also tell you that in my five years of being a Mom, there is nothing as exciting as the moment your child has mastered this skill. We scream, we jump, we cry. We have a new confidence that our children can be safe in the water and that is an amazing accomplishment and something incredibly fulfilling. Here’s Evie, one week before her first birthday! Yes, the point of these swim lessons is to teach your child to roll onto her back to survive in the water. But that doesn’t mean they don’t have fun. Our instructors have sung to my children, read water books to them while they floated, assisted them in diving for toys, playing with baby dolls in the water, and done lots of splashing. And my son that started off with all those tears? Well, he got over it pretty quickly! Have fun, be safe, and go get your swim on!